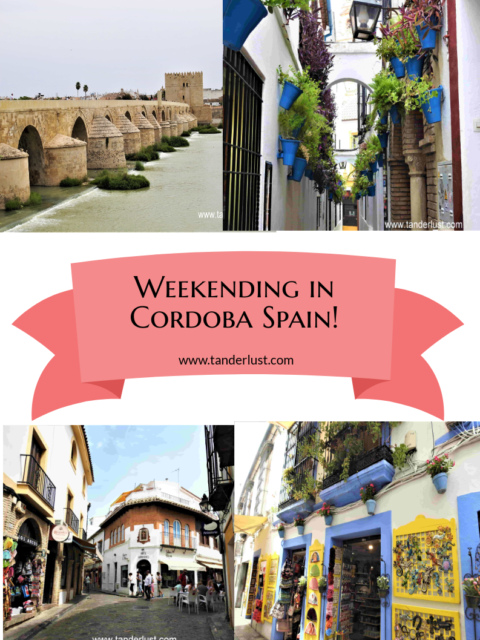 Cordoba, located in the southern part of Spain on the Guadalqiver river, is a city in the Andalusian region having fascinating architecture, beautiful white-washed walls and tiny cobblestone streets which makes you feel like you have jumped back years into history. Cordoba was roman settlement in its earlier days and later on in the 8th century, was colonized by the Muslim armies and was made the capital of the Muslim rule. After few years yet another war took place wherein this city was re-captured by the Christian forces. 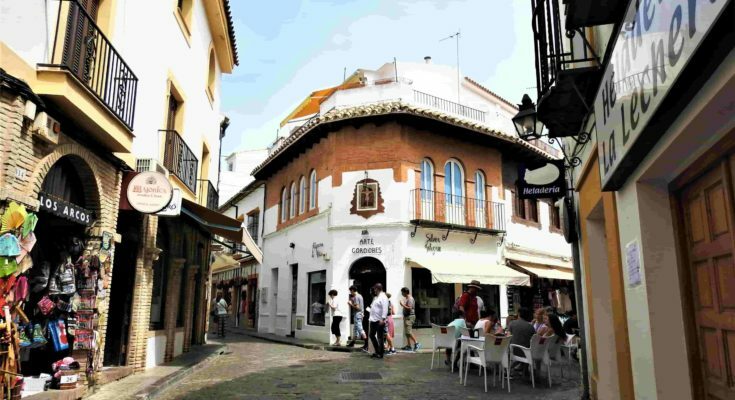 Hence, as soon as you start exploring Cordoba you will see the blend of Roman and Moorish architecture in this city. Today, Entire historical town of Cordoba proudly wears the tag of being in the UNESCO World Heritage Site and one can only imagine the mesmerizing beauty of this city. The Alacazar de los Reyes Cristianos is a medieval fortress forming a part of the historic center of Cordoba and hence also added to the UNESCO World Heritage Sites. 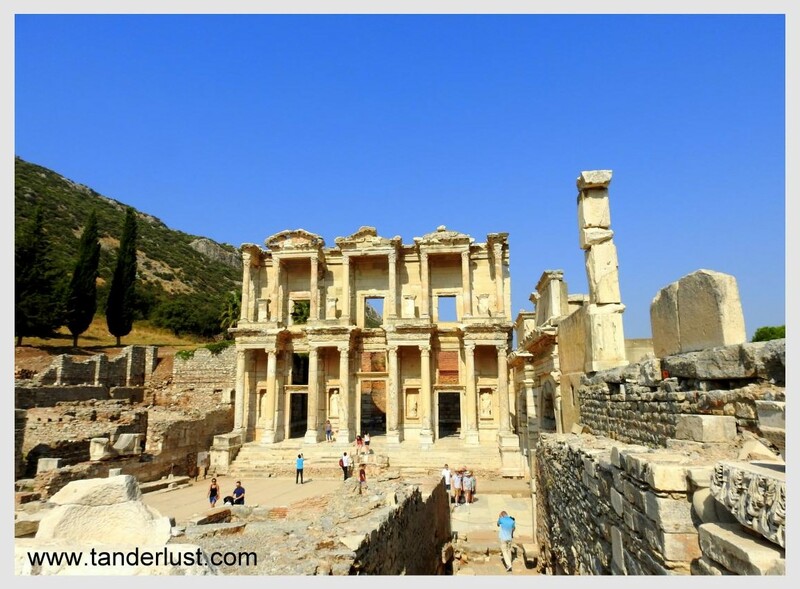 The architecture is built in such a way that it looks sober on the outside, however on the inside it looks magnificent due to the beautiful construction of Hall of Mosaics, The Courtyards and the Royal Baths. This Alacazar mainly had a military importance back in history when the Christians forces came back to re-capture their city from the Arabs. From 1482 it was headquarters of the troops of the Catholic Monarchs for few years. The timings of the fortress are divided based upon the time of the year i.e. Sunday and bank holidays: 9:30 am. to 2.30 pm. Throughout the year, From Tuesday to Friday from 8:30 to 9:30 am., except holidays, admission is free. So if you visit the fortress during the morning, you will end up saving plenty of money. Adult – € 4.5, Students – € 2.25 and Children under 14 – Free. The Roman bridge, located right in front of the Mosque Cathedral or La Mezquita, overlooking the Guadalqiver river. This bridge has beautiful views of the city and the river on both its sides. At the other end of the bridge, you can find the Torre de Calahorra. It was built first during 1st Century BC by the Romans, and so the name has been derived as the Roman bridge. The best time to visit this bridge would be during the night as you can see the entire city being lit up in lights which provides a beautiful backdrop for photography lovers. Not just that, this bridge was featured in the Season 5 of Game of Thrones as the Long Bridge of Volantis. 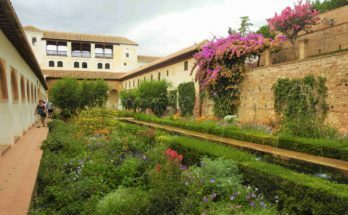 Calleja de las flores literally translates into ‘The Street of Flowers’. 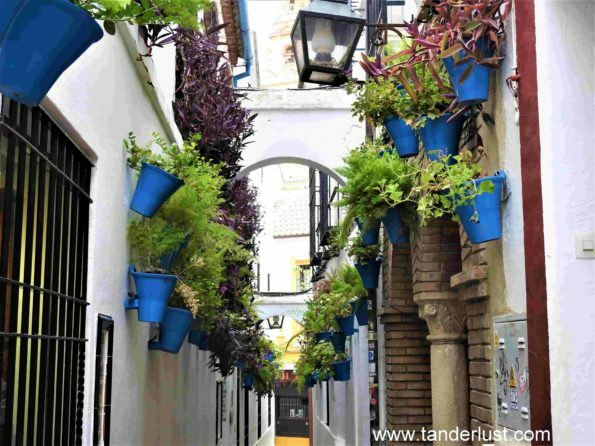 It is the most popular street in Cordoba due to the fact that the entire street is decorated with beautiful flowers and plants on both the sides of the street wall. 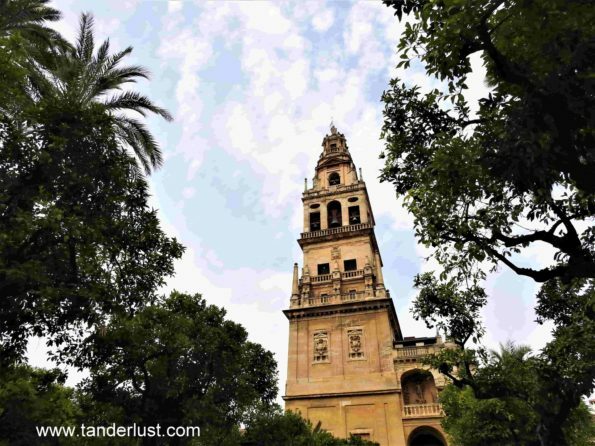 Within Cordoba it is located on the intersection of Street Velazquez Bosco right next to ‘La Mezquita’ and one can definitely count on this street to get beautiful pictures. Cordoba can be easily reached if you are coming down from the main cities like Valencia, Madrid, Sevilla etc. Usually people come here to spend their weekends and explore this tiny tinsel town. BY ROAD: You will find buses from all the nearby main cities in Spain to come to Cordoba. The bus is the cheapest way to travel between cities however, it takes many halts and goes through many villages which is why it is a time-consuming journey. Apart from that one can also carpool with the other people doing the same two cities through this website called as BlaBla car. It is quite safe and the best way to have a road-trip along with some strangers going in the same way. Unless, you are coming to Cordoba for a day trip from Sevilla, I would not recommend taking a bus from Madrid or from Valencia as it would take around 10 hours approx to reach Cordoba. My recommendation would be to take the train. BY TRAIN: If you are low on time you should hop on to the Renfe trains of Spain. These are high speed, inter-connected trains running through the entire country. You can check the time-table and book your tickets online on www.renfe.com But the price of the tickets of these high speed trains are quite expensive so as per my suggestion, only doing the long distance journeys would be cost-effective. BY AIR: Cordoba Airport is a small airport in Spain catering to national travelers. It is located at a distance of 6 km from the main city. To reach the city center you can take bus line 0-2 which stops on the main road near to the airport. There are about 15 buses a day from 06.30 to 22.30. The single fare is 0.80 Euro. A taxi is about 10 Euro to the city center. The climatic conditions in Cordoba is quite extreme during different time in a year. As it bordered by other cities there is no sea nearby due to which the weather can at times be harsh. 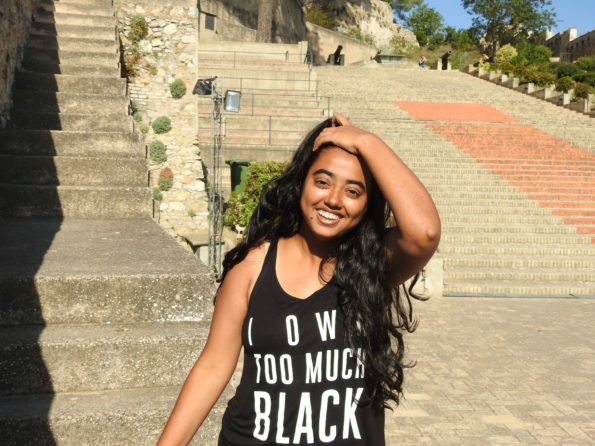 I went to the city during the summer months and I could literally feel the heat. Hence it is extremely important to carry along with you different creams to protect your skin no matter what time of the year you are visiting this city. Summer starts from June to November and is hot, dry and sunny, with temperatures ranging from 30 °C to 45/46 °C (97 °F) to (113/115 °F) throughout the period. Also due to the fact that there is no sea around there is very little to no humidity in the atmosphere. Also at the end of the summer months you may experience rainy days and the temperatures will start to drop preparing for the winters to start soon. 10 °C, but during the day it remains very rarely below 10 °C (50 °F). From March you will find the temperature slowly start to increase preparing for the summer to start soon. 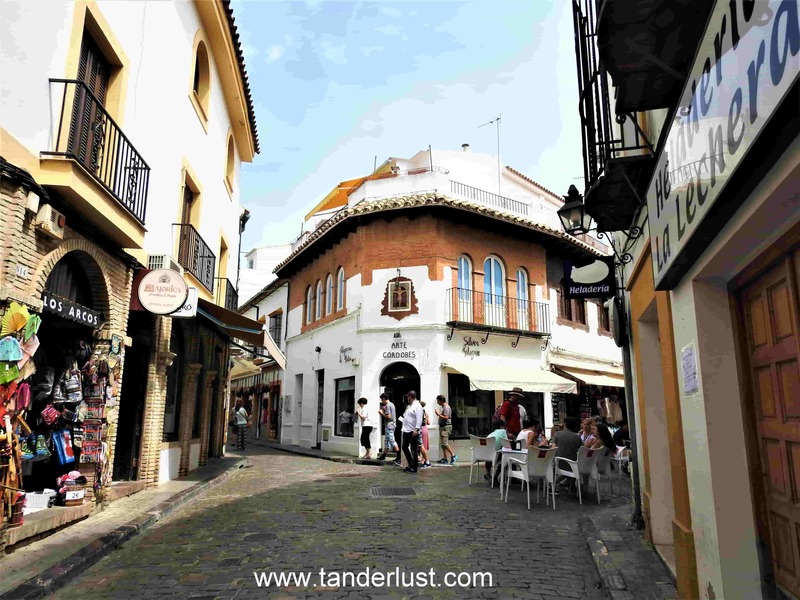 In order to avoid both the summer heat and the winter rains, the best months to visit Córdoba are March, April, May and October. Those who can stand the heat can also choose the summer, but they have to be prepared for the scorching heat. You need to carry proper caps, umbrellas and sun protecting lotion if you intend to visit Cordoba in the summer months. In winter, you can find several pleasant days, sunny and spring-like, although it can get freezing cold in the night, and cold winds are not excluded. 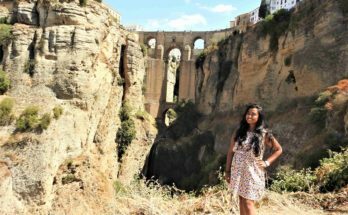 During my time in Cordoba, I stayed at Option Be Hostel and it was the only hostel which also had a rooftop pool in the entire city. Imagine swimming in the rooftop pool during summer! Bliss! They also offered free breakfast and free Wi-Fi and it was a treat especially for budget travelers like me due to low prices and all attractions being at a distance of only 5 minutes by foot. Not just that, the owner of the place also offered me a 10% discount on the next hostel in the next city that I was supposed to go. How cool is that! And needless to say, I would totally recommend this place to anyone looking to stay on a budget! 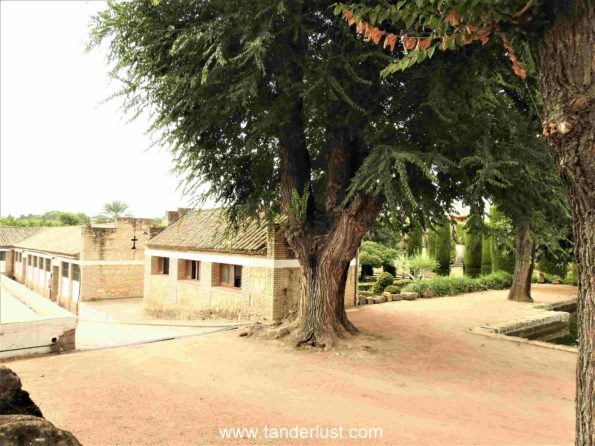 You can also choose from varied other place depending upon your budget and book that place online here: Accommodation in Cordoba. 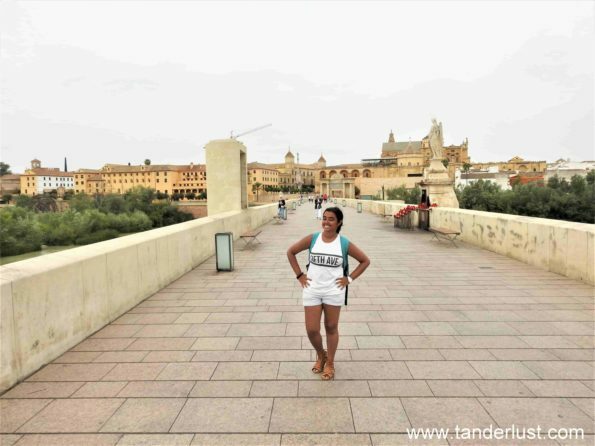 WHAT TO SHOP IN CORDOBA? Cuerdo Repujado or original Cordoban leather as it is called in English along Olive Oil is the authentic product of this city and that is what it is famous for. Apart from that, This city is an epicenter of Flamenco dances and plenty of Flamenco (Flamenco is a traditional dance form of Spain) products are famous in Cordoba. 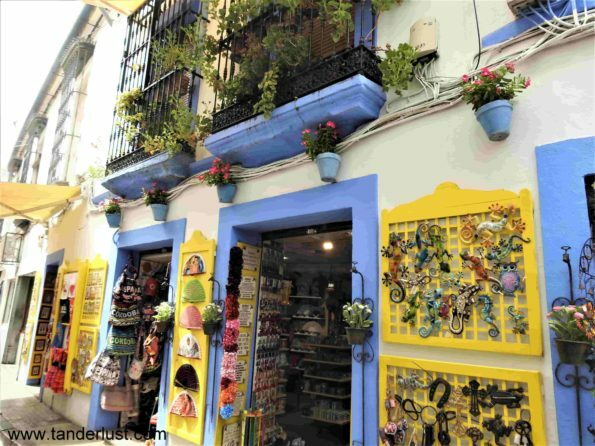 It is here where people often buy the traditional flamenco dresses and traditional flamenco jewelry from the shops. You will also find Souvenirs, precious stones, artifacts etc in all the shops. But be ready to bargain as they often charge higher price especially in the main touristic areas like the Mezquita. 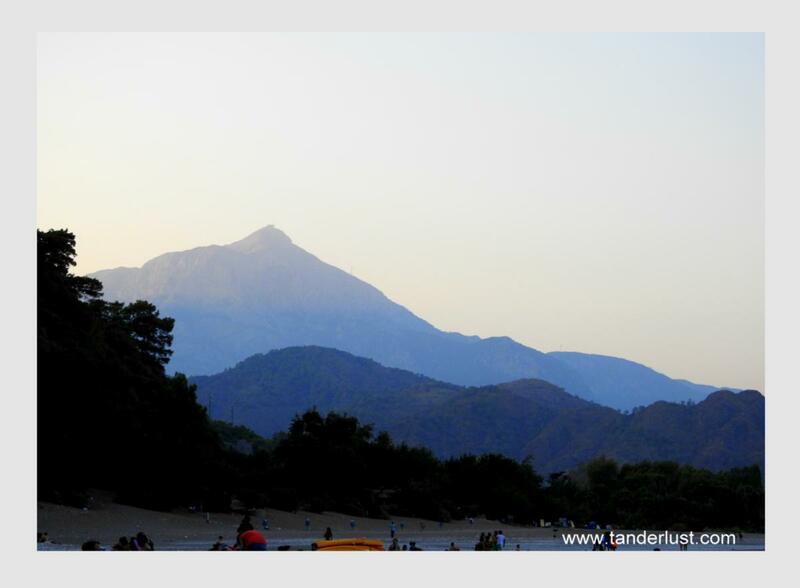 Cordoba is mid-budget in terms of accommodation charges for a normal budget traveler. Hostels start from 15-20 euros per person whereas mid-ranged hotels will start from as low as 50 -100 euros for 2 persons. Hence, if travelling in pairs it is convenient and reasonable to book hotels whereas hostels are a safe bet for solo travelers on a budget. Also, there are plenty of luxury options for persons wishing to live a luxurious life and lot’s of hotels are located right in the city center. The cost for luxurious hotels start anywhere from 100 – 200 euros per night. Food outside is mid-ranged. The cost in any restaurant for a complete meal can start anywhere from 05 – 20 euros. If cooking by yourself then this cost can be brought down to almost half. You will find supermarkets almost everywhere and that is definitely the best way to decrease the overall cost on the food. As per this Cordoba travel guide, there are plenty of things to do here some of which I have already mentioned above. Most of the places doesn’t require you to pay any entrance charges. 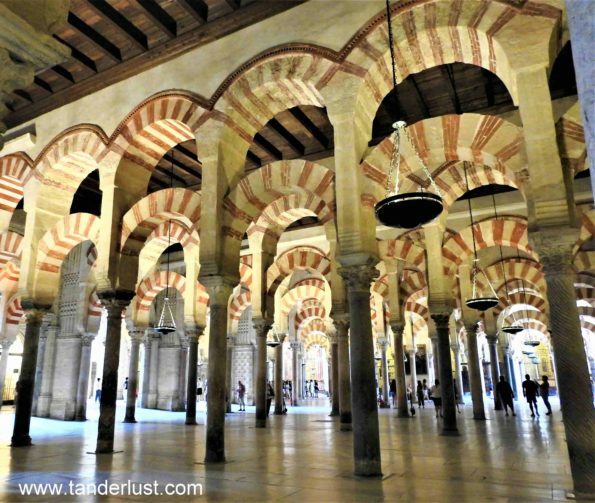 Even the popular mosque of Cordoba is free of cost for few hours in a day. This entire atmosphere & the vibe of Cordoba is sure to take you back into history once you enter into the historical side. And as far as paying for activities is concerned, make sure to end up at the locations half an hour before the free hours as you will usually have to wait in a queue to get you ticket and enter your desired architectural hotspot, Also, you need to pay only if you take any other tours. Hence, you can end up saving money on the activities as well. 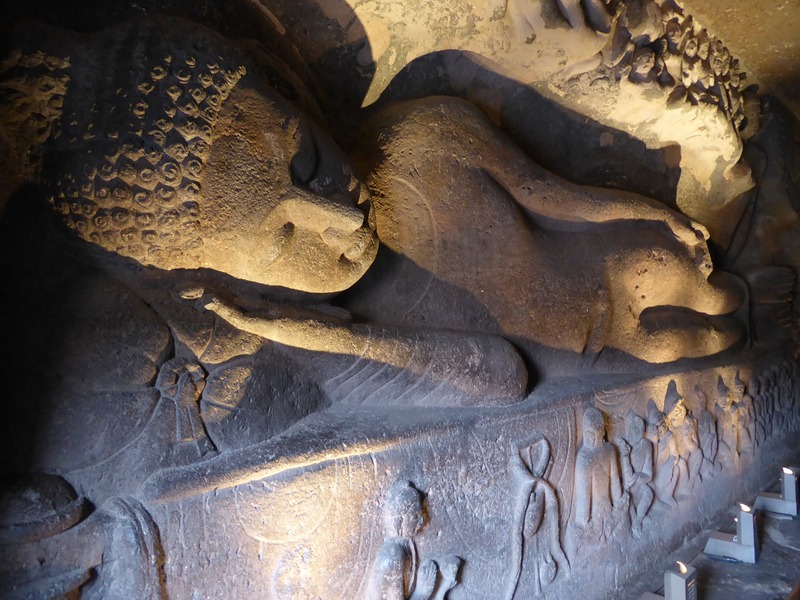 Previous Article Find out what I discovered in Marleshwar, Maharashtra now! 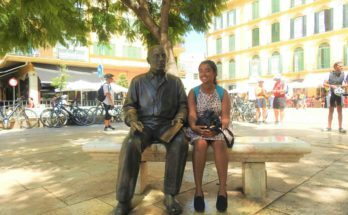 Next Article Nerja – A day trip that took me by surprise!